My trivial aim in the present jottings is a viewing of developments in the recent Chappies Bubble Gum advertisements which use historical events as props to accentuate the importance of the gum as a knowledge assimilator. These recent television advertisements are a revival of a product that many of us today will appreciate the resurfacing thereof on our television screens after quite an absent spell from our television screens. In its heydays not only was this gum delicious it also came with general knowledge index which one could peruse once the chewing started. However the ingenuity of the product’s presentation was crowned by the fact that the wrapper became a collectors’ item not based on its looks only but on the valuable information provided on the reverse side as – facts covering history, geography, science, literature and art. The wrapper was so versatile that some people made crafts like hand made belts by weaving wrappers together into a string. To date the Beaver has remained its recognizable symbol. It comes in flavors of grape, watermelon and original fruit as well as peppermint. It is the manner in which it makes its return to the television screen that I think blesses it with attention once more. It is its mythologization (permit me to use this word) that affords us the opportunity to want to taste it again, if we have moved on to high prized chewing gums like your so called sugar frees, to experience the legend. There are two advertisements that have been shown recently on our television screens of Chappies Bubble Gum. Both of these advertisements have historical themes as pedestals to accentuate the product, or should I say they mythologize the gum through historical references. I propose that we look at the two advertisements in order to reveal their similarities as well as their differences. In this regard we shall stand a better chance of revealing the nature of Chappies Bubble Gum’s revival through historical allusions. On another level we shall also reflect on the targeted people that the product is geared towards and how this is achieved. The first advertisement has as its content a group of children visiting a cultural history museum and the second recent advertisement is rooted in the historical event of the sinking of the Titanic relayed through a newsreel watched by a boy at a movie theater. A group of children are attending a guided tour at a Cultural History Museum, they are been introduced to the civilization of the Honolulu (Hawaii) and as the tour guide explains the turbulent nature of their environment – specifically the volcanic eruptions. One of the little one’s has a big idea. He deeps into one of his pockets, comes up with a Chappies Bubble Gum and pops it in. Instantly he is transported to Honolulu in midst of an evacuation due to a volcanic eruption. With might akin to that of Incredible Hulk he picks one of the rolling rocks and throws it to the mouth of the erupting mountain succeeding in closing it and stopping its molten lava from oozing out and annihilating the Hawaiians. The ancients of Honolulu cheer him up and happily carry him indebted to him for saving their lives, civilization and environment. He is momentarily transported back to rejoin the tour, his counterparts had been frozen in time during the teleportation and the ‘historical intervention’. The anchoring force here is the historical tragedy of the sinking of the Titanic. We are shown viewers in movie theater watching a newsreel rendition of the sinking of the titanic. At the terrible moment when the ship is about to hit one of the floating ice slits a boy amongst the viewers pops a Chappies Bubble Gum and he is teleported into the news reel (into history) to intervene in disastrous event that caused the sinking of the Titanic. Like the Honolulu intervention the intervener is rewarded, this time by being thrown a party on board the ship. What becomes apparent then with the two situations that the adverts present to us in reviving our interest in the Bubble Gum is intervening nature of the protagonists in both of these works. Similarly they are dealing with historical events, thus automatically they tie very well with what the bubble gum wrapper as part of the commodity packaging offers. A second similar feature is teleportation into the historical past. This way the advert is not only telling us that it offers an indexical historical feature – it takes you there. We become the boy, we have to, in order to make sense of what the global message is: Chappies Bubble Gum is not just a chewing gum it is steeped in historical facts and by buying it, you are actually buying historical facts as well. Now let us look at the differences of the two adverts. While the first advert that was televised deals with near ancient historical event, the Titanic sequel deals with an event near. Very nearer because of the hit Titanic movie most of us has seen. Now this second installation is arguably an advance, a step ahead – compared to the first advert and it embellishes what I have already proposed at the opening of these jottings – that most of us will come to appreciate the resurfacing of the Gum’s advert simply because we grew on Chappies Bubble Gum. The advert is here married to a popular cultural object, Titanic the movie and if we take the indexical feature of these adverts and reconsider once more Titanic the movie itself we shall accept that it is an index of the historical event of the sinking of the Titanic without doubt. Here we are then at a threshold of a sign, a referent and a referent which in turn is a historical sign. Here Chappies Bubble Gum exhumes a historical ghost in order to arrange its self methologically. But the viewer has to be part of this play of mythologization for the myth to be constructed. Why? Because without viewer’s knowledge of the movie Titanic the first sign becomes opaque: the boy watching the newsreel. The viewer will just see a little boy with superhuman strength stopping a huge ship from colliding with an ice mountain, which is actually absurd! 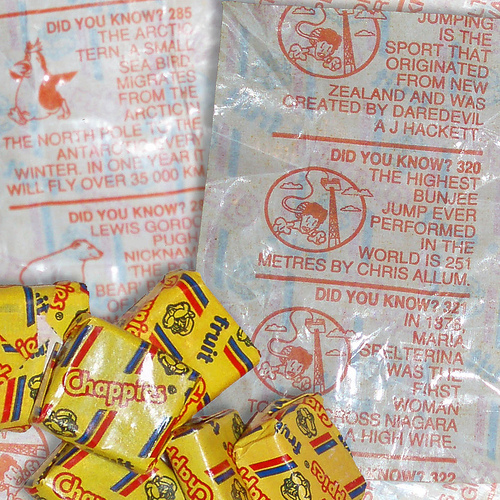 Chappies Bubble Gum >>> Titanic news reel >>> Titanic the movie >>> Titanic the historical event! The latter ‘Titanic the historic event!’ in our schema above is pregnant with ideas and it is these ideas that the advertisement anchor in order to send out its message and by so doing to once more occupy its space of prominence amongst the competing chewing gums. Explicitly speaking this commercial advert plays with historical event of the sinking of the luxury cruiser by saving it from sinking thus altering history mythologically, in turn creating what I propose to call a Y effect; a one directional historical narrative which separates at a particular point and moves into two opposite directions diagonally, one factual and the other untrue –mythic. The ‘super boy’, let us address him as such, represent an omniscient force, the knowledge bearer of what will happen at the impact of the cruiser and the floating ice – he is nothing else but that knowledge itself of the sinking of the Titanic but personified. He is that knowledge that will be unwrapped when the gum is opened. Hence, unwrap an adventure! Both of these Chappies Bubble Gum advertisements uses historical events as tools to prop and accentuate the importance of the gum as a knowledge assimilator.